This entry is a follow-up to the article about my first homepage. Back in the summer of 1996, the fourteen-year-old me was youngest ever employee at Corel Corporation. My job was as a "Quality Assurance Assistant" for a little-known product, Corel WEB.SUITE. This product was composed of WEB.DESIGNER, WEB.WORLD, and WEB.DRAW, a slimmed down CorelDRAW with focus on output to screen graphics as opposed to paper. Of particular interest to me was WEB.WORLD, an early (and very simple) VRML editor. At the time, this technology seemed to me as the future of web sites. Information could be organized spatially, objects could be hyperlinked, it ran decently fast on the blazing-fast Pentium-133s of the day, and it was generally quite popular. 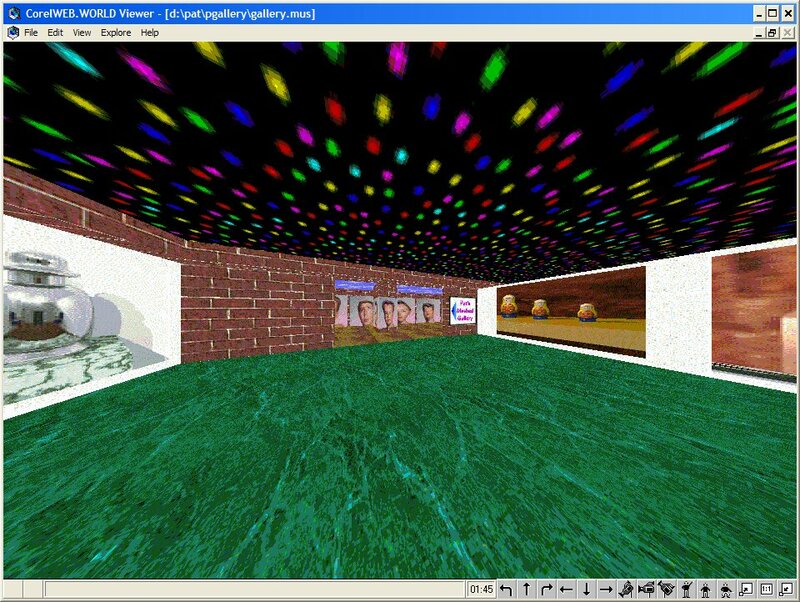 Sites all over the place required a VRML plugin. For my testing purposes (and because it was fun), I made my online gallery of computer renderings into a virtual 3D gallery. They were grouped by "room" and you could click on the images on the walls to get the full version of the image. It was a fun way of navigating the site. Somewhere along the way, VRML died off, and now Flash has essentially taken its place everywhere. Yes, the intended purpose of Flash is different. Another big difference, however, is that VRML was based on an open specification that anyone could write a plugin and an editor for. That fact, coupled with majorly increased 3D graphics performance toward the late nineties, make its fate a curious anomaly of the web. Why did it die? I don't know. But if it had taken off, the net could literally be a completely different virtual landscape today.